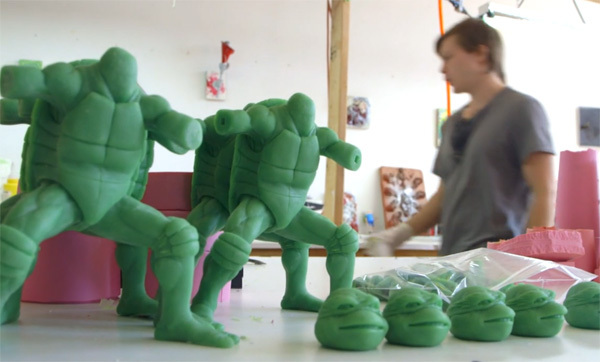 Anthony Lasedich created an incredibly fun, awesomely insightful behind the scenes look at the small group of folks fortunate enough to work as full time toy sculptors and prototypers. The Secret Story Of Toys offers us the perspectives of a few artists in that position, who are also in a state of disbelief as to how cool their job is, as well as a little look into the process that goes into creating a prototype sculpt before production. Just a look at the space that these guys work in, as well as how humble they all are is incredibly inspiring to say the least. If you look carefully enough you'll also get a chance to see the early prototypes of the upcoming Spy and Engineer toys from Team Fortress 2 as well as some other cool toys. This playful mini-documentary just left me wanting more, and I honestly hope to see Anthony create more behind the scenes looks at these niche industries. Just prepare for some career path regret after watching these artists talk about how lucky they are to have such a fun, laid back job. 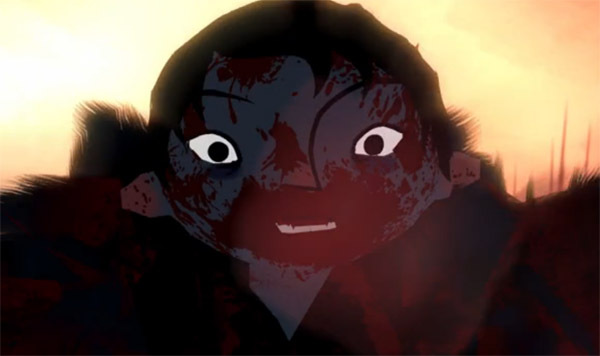 Recent art school grad Olivia Huynh directed and animated the subdued, childlike short entitled Borrowed Light. A young thief of a girl goes around stealing people and businesses of their lightbulbs. The loss of electric light, one of the most life-changing inventions that we absolutely cannot live without. Or can we? I loved how touching, and innocent this short is, and really plays on Huynh's self-described childhood influences. In what appears to be a style emphasizing a distinct, washed out watercolor look, it pairs perfectly with the subtle sound treatment and innocent plotline. When the amount of scifi content reaches critical mass, we must balance our content with a palate cleanser in the form of some good ole fantasy art, which brings us to the art of Obo. 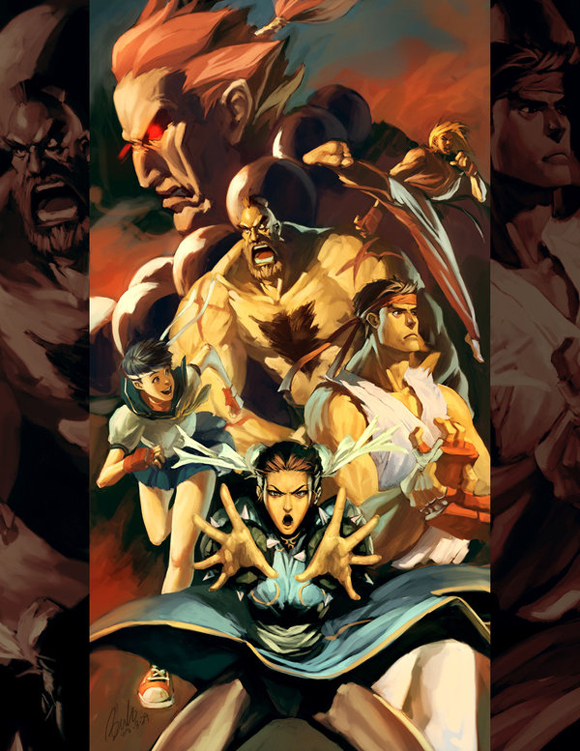 Based out of China, the traditionally trained digital illustrator has joined the ranks of Applibot, which in the last year or so has managed to recruit just about every talented head in the industry for it's digital trading card franchises. 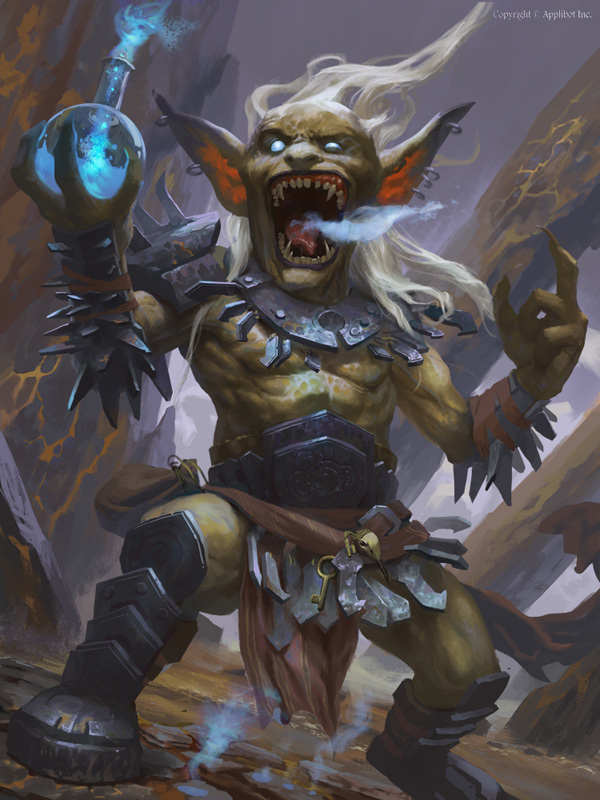 Obo's traditional background comes through in his digital work, down to his painterly strokes and firm grasp on colors, enabling him to execute some truly fun compositions, despite the played out subject matter he's been assigned at times (The piece above is called 'Yet another Goblin'). Obo keeps himself well rounded with a healthy amount of plein air painting (Basically outdoor painting) in nature. 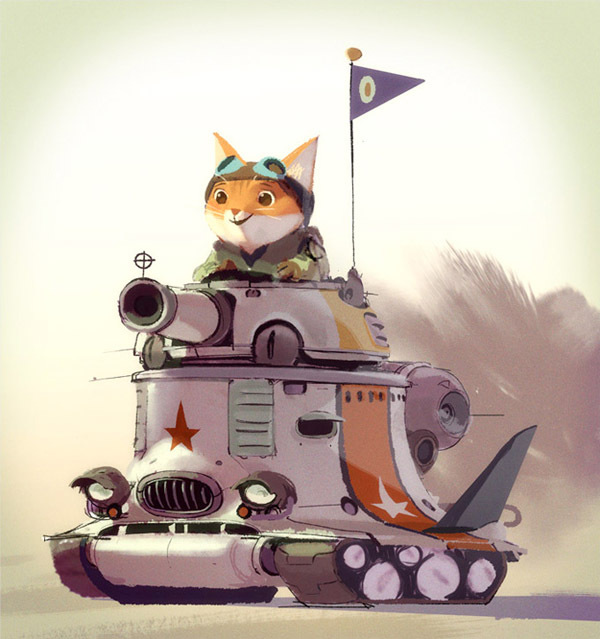 Check out some more of his solid illustrations after the break! Cinematic animator Emanuele Pavarotti just recently released a comprehensive set of insightful process breakdowns regarding his work on Disney's underrated adaptation of Edgar Burrough's 1895 scifi epic, John Carter (Of Mars), a film that I still believe failed thanks to the atrocious marketing behind it, including it's last minute name change to remove any semblances of scifi themes. This can be attributed in part to director Andrew Stanton's (Toy Story 3, Wall-E, Finding Nemo) getting the ability to dictate how the film would be advertised. So in a nutshell give the movie a chance, it's actually pretty solid and well acted, and the visuals are nothing to scoff at either. Emanuele's work is such an example of the amount of effort poured into each and every shot, where he acted out, blocked out and refined in multiple passes with the input of the director and multiple departments. Since his work on that project and Clash Of The Titans, he's gone on to work at Blue Sky on projects including Rio 2, Epic and the fourth installment of Ice Age. What if over 100 blockbuster movies were edited into the ultimate epic trailer? That is what Vadzim Khudabets, an aspiring trailer editor set out to create as a means of showcasing his skills in Eterna, which is a pretty jaw dropping effort that also doubles as a potentially negative (Depending on your interpretation) showcase of homogeny in trailer creation over the past few years. Nonetheless I can't help but appreciate the sheer amount of effort it must have taken for Vadzim to scour this massive library for the perfect shots to execute Eterna in it's entirety. 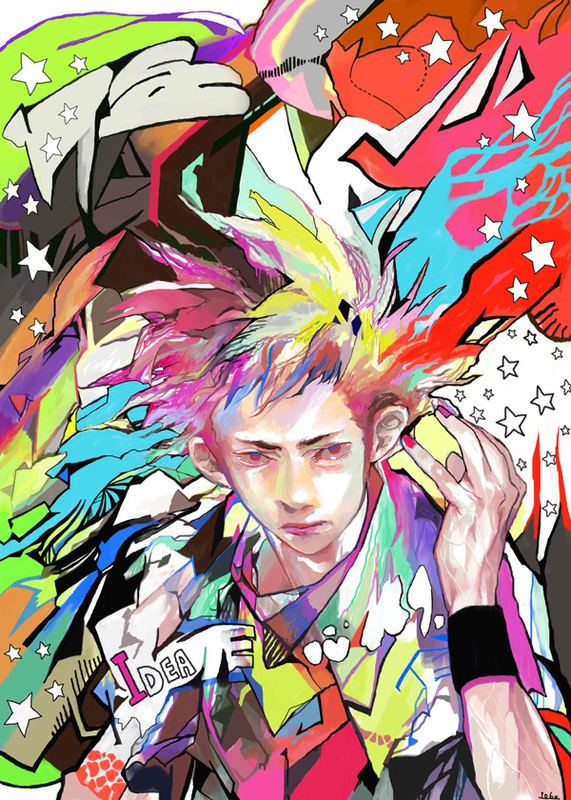 Artist Toridamono has an an amazing sense of color, with a set of work that varies from colorful and fun to epic and (somewhat) dark while still maintaining a full pallet of colors. It seems that more recently, Japanese artists have been experimenting with an added level of color, using colors not normally used in a piece while still maintaining a level of depth and detail seen with a more limited color selection. The particular piece above initially caught my attention with it's unique armor design, giving life to an object that normally would be nothing more than accessory, much like the rest of Toridamono's work. After the jump are eight more pieces by Toridamono, each with their own unique flavor and point of view. Another recent addition to Cartoon Brew's annual Student Animation Festival is Barbara Bakos' animated short, Lady with Long Hair. It's a very lovely story about an elderly woman and how she is led the reminisce about her younger years. The stylized, whimsical, and mostly colorful art is balanced out nicely by mostly silence, followed by quiet, dreamy music. Stick around for the metaphorical, and touching ending! Created by Colliculi Productions, Post Human is a pretty damn amazing, dark scifi short executed by Humouring The Fates, noteworthy for being a self proclaimed last bastion of quality hand drawn American animation. Directed by Cole Drumb and featuring the voice of Tricia Helfer (Battlestar Galactica), the high quality animation and themes definitely draw some parallels with Akira and Aeon Flux. If anything I was simply left wanting more, so here's to hoping the already positive reception will lead to a more long form adaptation of this cool concept. Ramzes (Xi Zhang) is one of the most interesting industry concept artists I've run into as of late, with a highly surreal visual language mixing organic and inorganic shapes to create some rather startling, strange designs. Currently residing in the Shenzen region of China as an art director at Ten Cent, Xi Zhang uses a mixture of Zbrush and Photoshop to execute his surreal concepts, which draw heavily from insect designs with a touch of the grotesque and the unsettling. 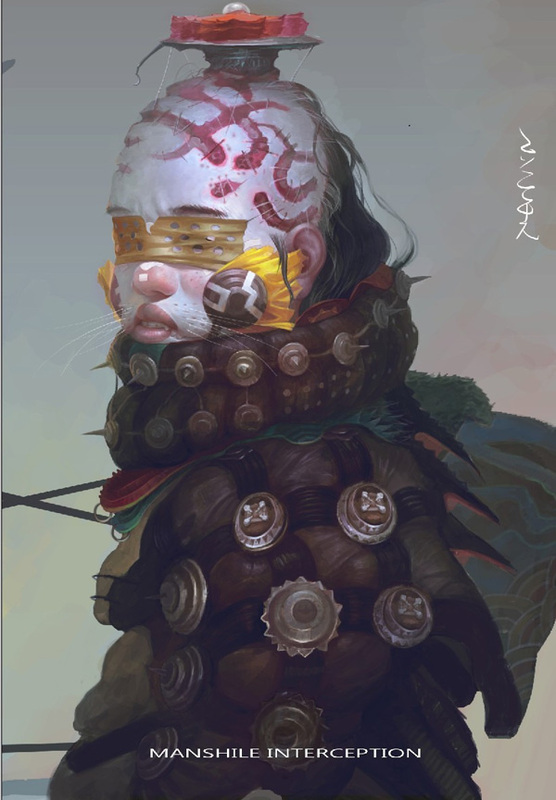 If you're looking for your daily dose of rather strange, semi-humanoid constructs, look no further than after the break to get your fix of Xi Zhang's signature blend of visually striking imagery. If you're headed to his website though, be aware that there is some NSFW content. While we don't usually post much in terms of TV content, this subtle, understated promo for the final chapter in the Breaking Bad saga was too good to pass up, narrating a passage from Percy Bysshe Shelley's famous short poem: Ozymandias. The theme of the passage, narrated by Bryan Cranston centers around the inevitable decline of all leaders, and the empires they once built, regardless of how mighty they once were. I met a traveller from an antique land Who said: — Two vast and trunkless legs of stone Stand in the desert…Near them, on the sand, half sunk, a shattered visage lies, whose frown, And wrinkled lip, and sneer of cold command, Tell that its sculptor well those passions read Which yet survive, stamped on these lifeless things, The hand that mocked them, and the heart that fed: And on the pedestal these words appear: 'My name is Ozymandias, king of kings: Look on my works, ye Mighty, and despair!' Nothing beside remains. Round the decay Of that colossal wreck, boundless and bare The lone and level sands stretch far away. Taking place in Peru's notorious Lurigancho prison, Storyhunter's documentary gives us a peek into a strange cultural phenomenon in the form of large scale prison aerobics, prevalent in some third wold country prisons. Known as 'Full Body,' in Peru, the doc follows the explosion of the program within the confines of the prison system, as well as an attempt to break a world record for the most people performing the routine. Anyone get the feeling this will be the next big thing hitting the paid advertising circuit sometime soon? Convicted of kidnapping, Alejandro Nuñez del Arco brings together more than one thousand inmates to practice Full Body aerobics in the courtyard of one of Peru’s most notorious prisons. With armed guards peering from above, Nuñez del Arco attempts to break the world record for the most people simultaneously performing the exercise, whether inside a jail or not. 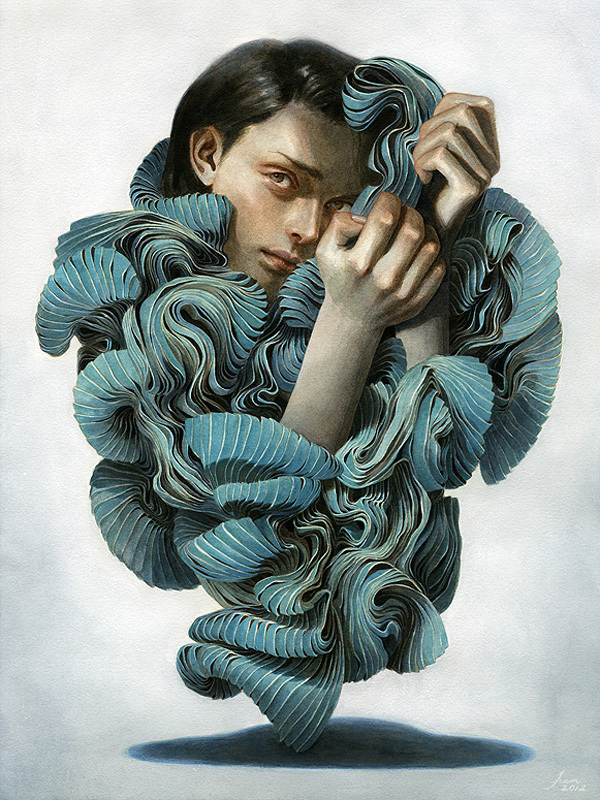 Tran Nguyen (Who goes by the alias of Pockypuu) is a Vietnam born, yet Georgia based illustrator who captivated us with her series of surreal portraits, featuring subjects suspended in various flowing materials or shattering into abstract, geometric pieces. Her distinct style is the result of a melting pot of influences, including the works of Gustav Klimt, Hayao Miyazaki and Bruce L. Moon. The wisest thing I can tell aspiring artists is to have a confident outlook. It’s crucial to trained yourself to accept that not every project will be successful. You’ll always take/learn something from every project, whether a success or not. Having a strong, optimistic mentality when approaching the industry is imperative if you want your career to go for the long haul. Check out more of her beautiful illustration work after the break. While games like Duke Nukem Forever have shown that an eternal development cycle can be a disaster, Legend of Iya is an indie project that seems to prove the complete opposite. After over a decade of development Andrew Bado has decide that the time has come to finish his dream project. With a decade of industry experience, Bado has provided his beautiful pixel art skills to the metroidvania inspired indie platformer, evolving the project from it's ZX Spectrum roots to what it is today. The game is absolutely gorgeous, showcasing a wide assortment of enemy and environmental design that flow with passion. It's not unheard of for an indie game to be stuck in a long development cycle, by the amount of time and work put into Legend of Iya is absolutely amazing. Andrew Bado seems to be extraordinarily passionate about this project and providing the help he deserves will be sure to provide an awesome experience for gamers. The game may slap you with nostalgia, but after getting my hands on the demo Legend of Iya is a title that stands on it's own, using inspiration from previous titles without succumbing to being too similar. To help Andrew Bado finish his project, you can donate to his Kickstarter here and also download the demo which was just released for you to try. You can also vote for the game on Steam Greenlight to help with a wider release. Japan's answer to a lack of music video dedicated television channel came in the form of Space Shower TV, who took advantage of MTV phasing out the classic formula that made them so successful by appropriating the rich combination of memorable idents and go figure, music themed programming. While it seems like a no-brainer to most audiences who grew up with the classical formula on their music channels, try explaining that to modern day, out of touch corporate overlords running these networks. We've featured their amazing 30-45 second idents before, but the extremely prolific channel has put out dozens more, pushing the envelope with some truly imaginative new mediums of delivery, including glitch art, pixel hacking and more. Examples like Otsuki Strong's amazing PC Engine tribute to retro Japanese anime dating sims (Above), Memory Crush or YKBX's glitch/anime Electronica kind of make me long for the days that channels had more of a strong visual identity compared to what we get these days. Check out just a small handful of idents created recently for the vibrant channel after the break. Created by Youtube user Honda Brigit as an earnest attempt to 'pray for the success of Pacific Rim in Asia,' this awesomely grindhouse-y trailer for Guillermo Del Toro's greatest film yet combines the classic Godzilla style trailer with the modern Kaiju battle film in an old meets new fashion. In regards to the timing of this Toho trailer, Pacific Rim will be hitting some of it's potentially huge markets later this week with a release in China on the 31st of July and Japan on August 9th. While the movie under performed in the US with an $80,000,000 gross against it's $190,000,000 budget, it's fared much better in the worldwide market with $140,000,000 in revenue and counting. Here's to hoping that the movie blows up when it hits it's last batch of markets in the next few weeks. Created by the foodie oriented folks at the Perrenial Plate, 10 Things We Love About Italy is a dangerously appetite building, high energy tour featuring ten staples of the Italian diet and it's many different variations and applications. In order, the whirlwind tour covers pasta, pizza, espresso, olive oil, truffles, wine, parmesan (Aka Parmiggiano Reggiano), balsamic vinegars, gelato and prosciutto! Brace yourselves for some machine gun style editing in this quick, gastronomical tour of a beautiful country. Created by Kristin Kemper over the course of her 4th year as her thesis film at the School Of Visual Arts in New York, High Tide is a narrative tied together by all of her favorite things: Merpeople, school children with magical secrets, the color aqua and hermit crabs. When a girl makes a startling discovery in the beach outside her school, the least likely person turns out to be the most supportive of the fantastical encounter. It's a chipper, straight forward short with a sketchy line style reminiscent of Sylvain Chomet's The Triplets Of Belleville. BioWare concept artist Ben Lo has a major knack for adding a bit of extra flare to his character art. Using a very painterly style, each of Ben Lo's works displays an incredible amount of detail put into the characters emotions, something that BioWare is known to greatly excel in. While many of these pieces are not necessarily developed for BioWare titles, Lo does an awesome job at translating his style into other well known IPs. Check the break for more of Ben Lo's work. Independent illustrator Kana Ohtsuki embarked on a journey sometime in the last few years, a journey that has been the quintessential form of self expression for artists over the generations: The self portrait series. Over the course of the last few years Kana has created dozens of self portraits of herself in an acrylic medium, visualizing herself in a way that reflected her state of mind at that time. In an attempt to diversify her numerous attempts, this has only lead her down the path of abstraction and surrealism, with her later attempts featuring visual additions left open for interpretation, which you can check out after the break. Cocoon is an aesthetic exploration in underwater movement. The short film was originally a part of a commissioned work for the Casino Helsinki for their large scale public screen, but is now released as standalone short film. 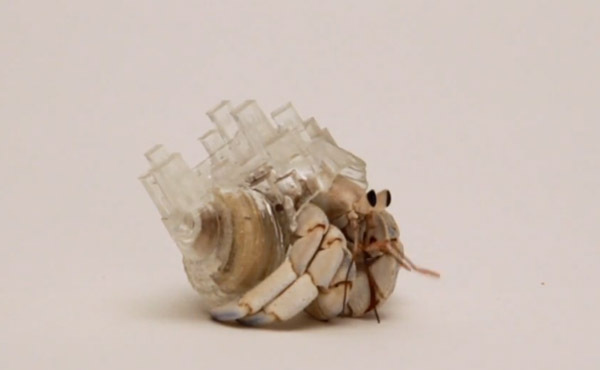 One of the coolest uses of 3d printing I've seen so far, artist Aki Inomata was inspired by her pet hermit crab to embark on a journey to take advantage of the crustaceans built in competitive side to claim ever larger shells. The minimalist video (Including having no audio) chronicles the creation of a 'Kingdom Shell,' in 3D to placing the finished, translucent product in the crabs tank, and the inevitable take over. Considering all the previous applications we've seen for 3D printing technology, this idea was truly born from Inomata's whimsical love for her unlikely pet, and her need to indulge it's primal instincts. Now we need a proper sequel to Shadow Of The Colossus to see this moving city in action. Originally created for the BBC Science Club, Extinction is a fun short animation chronicling how the complete disappearance of the Dodo resulted in a complete change of thinking in society, and the end of a more mystical approach to justifying discoveries like fossils. This more critical, fact based thinking lead to the birth of geology (The study of the earth), which allowed us to figure out how old the earth is, and our role in possibly creating a new extinction of sorts as a dominant species. Created by Asa Lucander and a team of animators, it's a clever, to the point presentation executed using a field guide style approach to animation, starring a professor composited into the scrap book styled pages observing the various stages of discovery. Mike Yamada is currently employed as a veteran visual development artist over at Dreamworks, where he's had a chance to contribute to projects including The Croods, Puss In Boots, Kung Fun Panda 2, How To Train Your Dragon and many other projects spanning his ten year career since graduating from Pasadena's prestigious Art Center design program. Yamada has juggled multiple projects in various genres, also dipping his toe into more realistic movies like Clash of the Titans and Avatar. Yet at the end of the day looking at an artists personal work truly shows where their thematic love lies, and he turned it into an awesome project called Zoom Zoo. The series of alphabet flash cards featuring animals and their awesome respective racing vehicles, kind of resembling a cast of a Mario Kart spinoff on steroids. While I'm happy to say that I do know my A-Z's, it looks like he had so much fun doing these that I wouldn't mind picking up a set myself. With movies like Turbo and Wreck It Ralph focusing on such racing themes, why doesn't someone pick this fun idea up for development? The entire idea sounds like a videogame or movie idea begging to get made. You can pick up a set of these fun cards at the ECA design studio store, and check out some more samples of his fun, stylized art after the break. The newest episode of Disney's ongoing Mickey Mouse features a rather interesting change in pace, focusing on Mickey's household problems as well as introducing some entirely new characters to the cast. Gasp centers around Mickey trying to help his fish called 'Gubbles' deal with a rather antagonistic cat when it outgrows it's rather measly fish bowl. Pluto is strangely missing, and I think director Paul Rudish's entire joke centers around the somewhat ironic concept of a mouse chasing a cat around an apartment. Be sure to check out the rest of the Mickey Mouse shorts that we've posted so far as part of Disney's new initative to revitalize and reinvent their classic cartoons here, featuring his wide range of misadventures at home and abroad. Let's hope they bring back Duck Tales too at some point, while they're at it. Academy Plus (or A+) along with Conkerco created this lovely short film entitled Glance. Centered around just that, a glance, we're shown a brief moment in time when two strangers cross paths. In a very emotional, if over-romanticized, montage we see the two strangers catch each other in eye contact, and follow the subsequent "What if?" scenarios play out in their minds. While perhaps somewhat over-the-top in theory, the execution is rather simple: Two people simply enjoying each other's company. It's a reminder of the simple things in life, that aren't exactly so simple to acquire. Pogo - "What I Likes"
Pogo (Nick Bertke) returns to his Disney roots with his latest mashup following a rather interesting year of musical remixes centered around international travel, cartoons and cult movies. His latest endeavor focuses on Disney's 1964 live action/animated hybrid adaptation of P.L. Travers Mary Poppins, executed in his signature style. Nick also put together a little documentary on his time explaining what he's all about, including his approach to creating his unique audio/visual mashups, thoughts on life and doing live concerts, which you can check out after the break if you're so inclined. Lenso Girl's (Sakamoto Himemi) serene illustrations are derived from her love of sweet things in the world, which makes her work quite relaxing to look at. Most of her pieces digitally emulate watercolor painting, resulting in soft, colorful pieces with playful themes and a mix of graphic and painterly components. There's a sense of innocent wonder to all her subjects, always juxtaposed into ethereal looking environments. 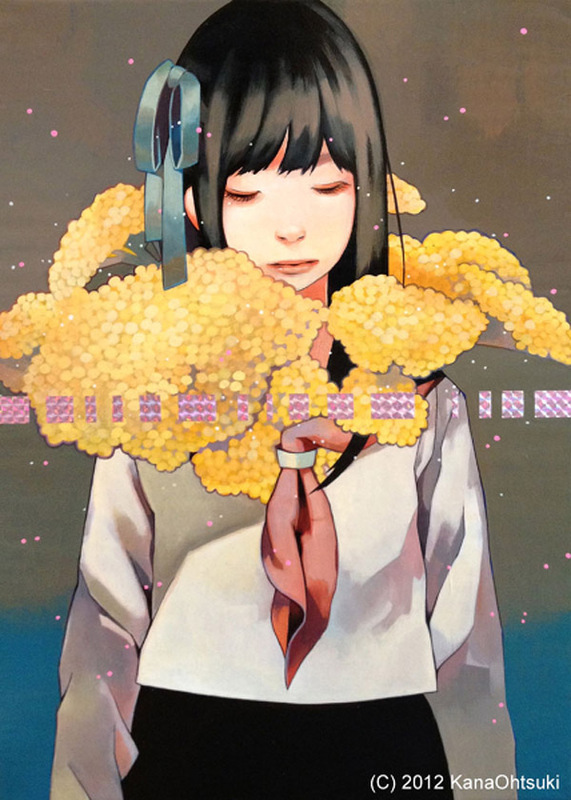 Sakamoto works as an independent illustrator, keeping herself busy with book covers, CD jackets for various indie artists as well as releasing her own 'Lenso Girl' books at comic conventions, featuring her latest illustration works. Check out more of her work after the break! Has science gone too far? While using pop culture and anime to advertise popular brand is far from new in Japan, this custom built Gundam might be pushing the trend a bit too far. Yes, I admit the glossy black color is badass but do we really need a Mech plastered all over it's body? Despite the ridiculousness of the mod, SunyBuny has knack for creating some of the best looking custom built Gundams on the market, and Gundam ver. Chanel is a quality project. SunyBuny's work on the Chanel branded Gundam isn't official, so if you're worried/excited about seeing a line of these lining the display window at your local upscale department store, don't fret because this is one-of-a-kind. For more images of the custom kit hit the jump. 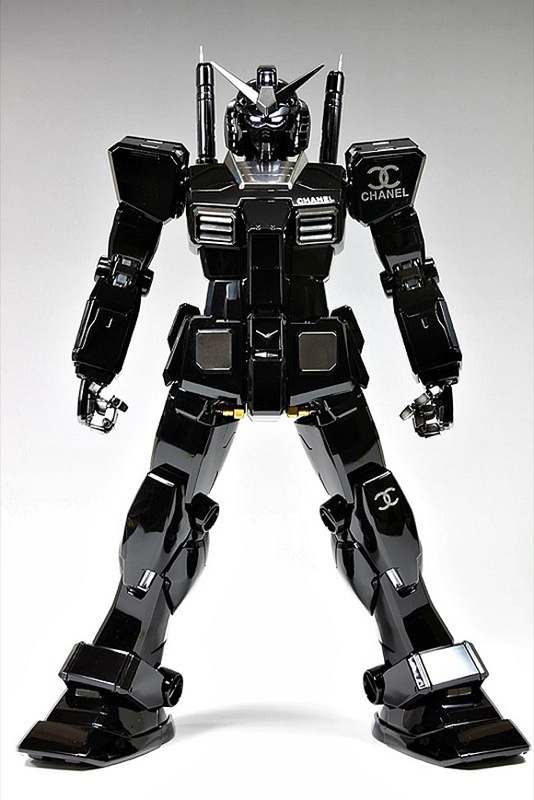 On a related note, don't forget to check out Chanel Gundam's mortal enemy that we covered a while back, Louis Vuitton Gundam. It's a moment we have all probably dreamed of. Well, maybe not to this degree (but I won't judge...), but that moment of just pure 'F*ck it!' just kinda falls on us. Nick Offerman plays a man who really, really plays out this fantasy as a man recently fired. Fired through text message, no less. Ouch. It's a music video for Fidlar's track Cocaine, and Offerman, with the help of a near-convincing prosthetic, decides to tell the world just what he thinks of it. Very, very NSFW! The design group known as Golden Wolf claimed that it was a dream come true to work on the electro-Reggae fusion dancehall project originally born from the mind of DJ/Producers Diplo & Switch back in 2008. The project has enlisted the likes of M.I.A., Santigold, Snoop Lion, Shaggy, Bruno Mars and many others since it's inception, as well as the directing talents of Eric Wareheim on multiple videos that to this day still haunt my dreams. 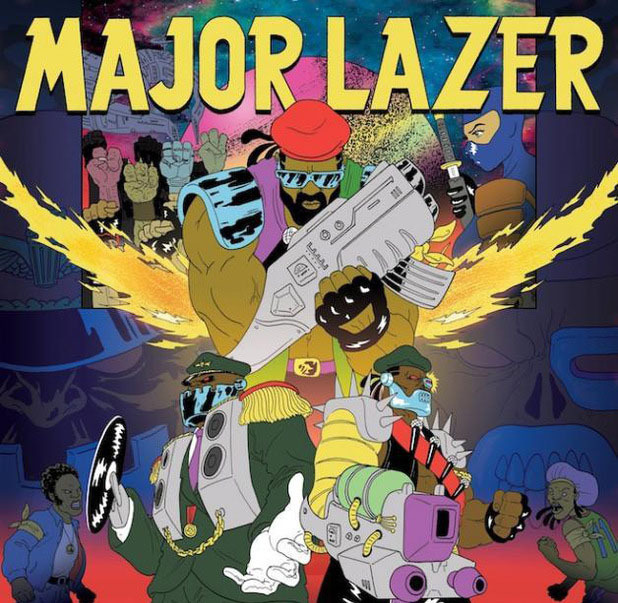 These visuals were created for the groups Free The Universe 2013 World Tour, showing the Gi-Joe era styled Major Lazer making his landing on a post apocalyptic planet following the events of the first album, ready to liberate the universe from it's cyborg despots. The album was released earlier this year under the Secretly Canadian label. 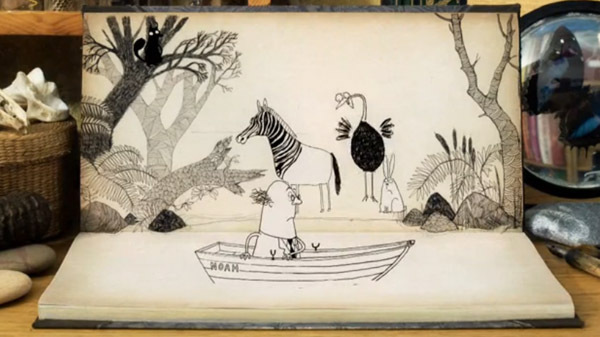 Animator Henrique Barone created this very pleasant, and warm animated short entitled The Man Who Saw a Boat. Self-described in the title, the story is about an apparent underwater-dwelling man (no, not a merman) who one day encounters something on the surface that he decides to explore. There's a simplicity, and a bit of a gentleness that ties together the very serene short. While the colors are bright, and the lines angular, it's balanced out by a very tranquil sound design. A very lovely short that reminds us a change of scenery is occasionally all we need. 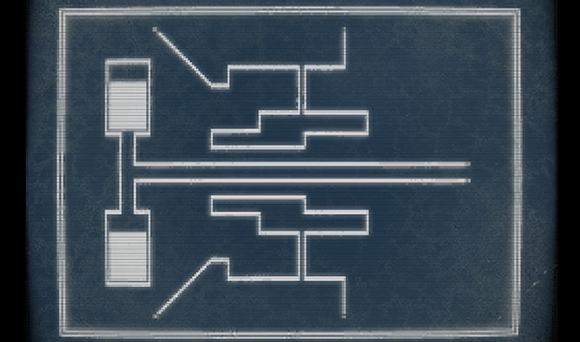 From the creators of one of the best runner games on the market, Canabalt comes Capsule which is describe as "technically a survival-horror game, featuring a posthumous epistolary narrative and a reactively generated abstract landscape that is different every time you explore, and tailored to deliberately create tense scenarios and close calls". The game relies heavily on resource management and you'll often find yourself in intense predicaments with no hope for survival. The game's sound design is by far some of the best I've heard in an indie title, and provides a level of tension that many big-budget AAA titles fail to create. While the game is a bit on the short side (about 2 hours), the time I spent with it had me on the edge of my seat through the entire play-through, and I'd be surprised if it wasn't the same for you. For $8 you can pick up a DRM-free copy of the game from the website, and for such a unique experience I'd say $8 is more than worth it. I know I wasn't disappointed, just bee sure to wear headphones while you play. Before I get into things, there are small spoilers in this animation, so watchers beware, if you've been out of the loop with Attack on Titan you should probably look into that, it's honestly the best thing to happen to anime in years. Like any quality series, Attack on Titan has spawned a massive fanbase over the past few months, and with every fanbase comes amazing fanart, but this is on a whole different level. Animators Arc & Mairi have put together this fantastic animation, which cleans up the original intro sequence. 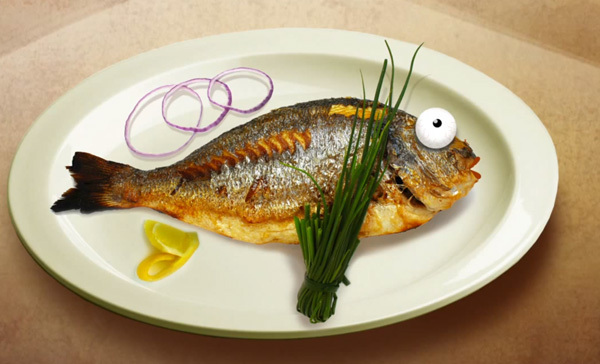 That's right, you can start laughing now, it was a really great pun. 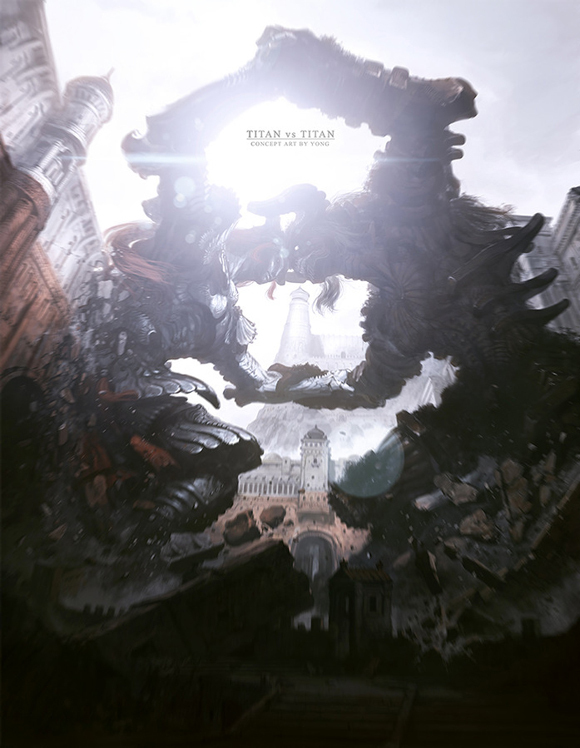 With the series just passing it's halfway point for the season, I'm interested to see what else the Attack on Titan community releases because it's going to take a lot to live up to this. 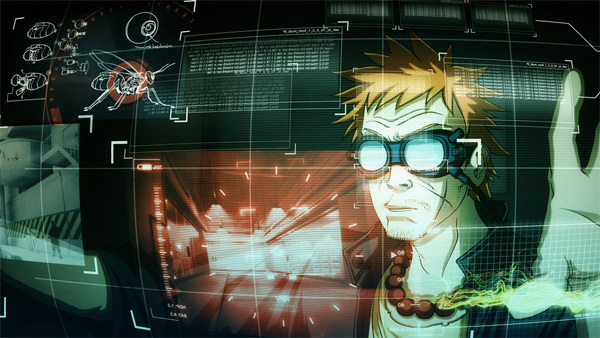 Sukabu isn't shy about showing off his affinity for cyberpunk, having crafted an entire universe ins his mind comprised of more stylized Ghost In The Shell style cyborg heroines, in various stages of enhancement, tinkering about with various black market technologies to achieve their true potential. 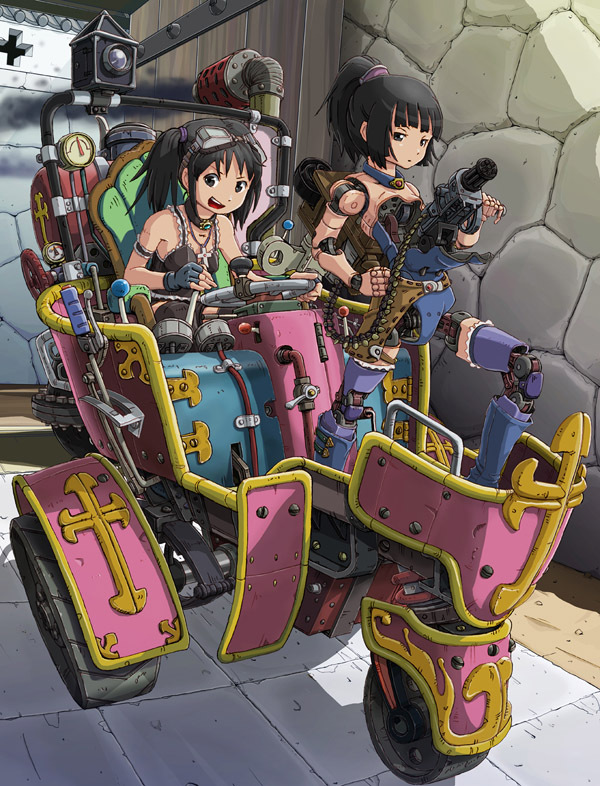 Despite the seemingly simplistic, cookie cutter anime style on the surface, replete with plenty of school girls and vocaloids, on a closer glance his work also exemplifies a deep love of industrial design and scifi that offer some rather interesting visual contrast between simple and detailed shapes. This mix of themes is just plain fun to look at, offering us a look into a strange futuristic world full of augmentations and cybernetic clutter. Check out more of Sukabu's realm of cybernetic protagonists after the break! Diplo & DJ Fresh Team Up To Promote Kickass 2 With "Earthquake"
DJ Fresh is back with his new single Earthquake, a distorted, glitchy, bombastic collaboration with Mad Decent label boss/Major Lazer frontman Diplo also featuring the vocal talents of Dominique Young Unique. The video treatment is noteworthy for it's thematic ties to this summers upcoming sequel to Mark Millar's Kickass, featuring Young walking down a crumbling city with a posse of grungy wannabe super heroes and a pseudo-Hulk-ish mutant to boot. While the somewhat experimental track doesn't quite hold up when compared to some of Diplo's other endeavors, the kickass visuals directed by Jonas & Francois provide a much needed accompaniment to round the experience out. The Earthquake single is set to be released on August 8, 2013 via Ministry Of Sound Recordings. 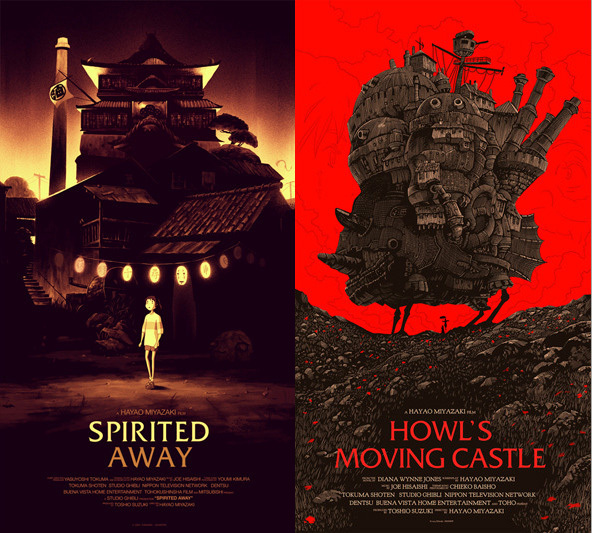 Time to camp out on Mondo's Twitter, as sometime today they're going to be dropping the regular, versions of their newest Studio Ghibli themed prints (Courtesy of the insanely talented Olly Moss). Paying tribute to Spirited Away and Howl's Moving Castle, these beautiful prints beckon to a bygone era of Studio Ghibli, as their direction lately has been much more grounded in reality, with their last fantastical feature being 2010's understated Arrietty. The Japanese variants were sold exclusively at this years San Diego Comic Con, and thanks to the overwhelmingly positive response they received a the event we will be getting a chance to get our hands on the westernized versions (Although I do think the hand written Japanese titles are much cooler). Both 20x36" prints are limited to hand numbered editions of 430 and will cost $50 each, and will be sold via the Mondo website. Good luck in scoring one, unless you're one of those damn eBay scalpers. 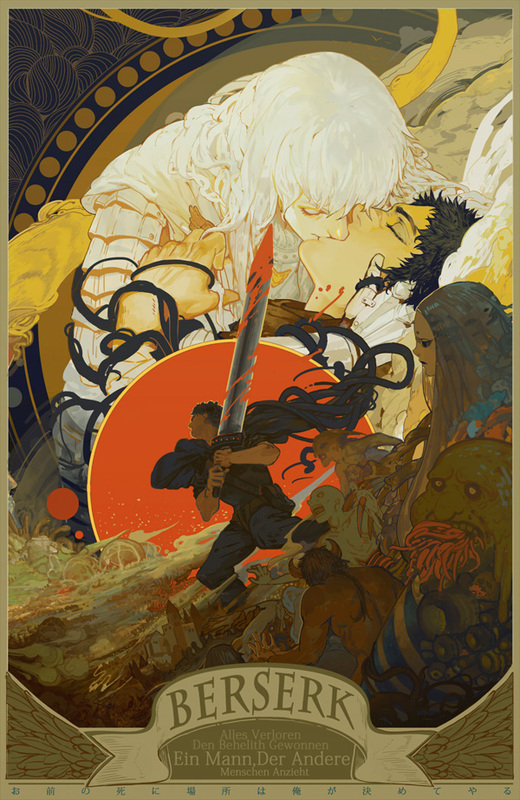 Check out the variant Howl's Moving Castle poster print after the break! British animator/illustrator Paul Rayment just put the finishing touches on his first installment of The Alphabet, featuring his more adult themed take on the Jim Henson style animated alphabet. Covering letters A-D and some choice word examples from each, here's to hoping that this neon-tinged installment will be the first of many to come. Humorous, dark and quite tongue in cheek as well. It's never too old to go digital! The Pixel Painter is a wonderful look into the life of 97 year old Hal Lasko (Lovingly referred to as 'Grandpa'), who found a new way to express himself as an artist thanks to his grand son introducing him to the world of computers. Originally a typographer in the analog age, Hal was afflicted with a debilitating visual condition called Macular Degeneration that lead him to believe that his creative career was over, which turned out to not be the case. Ever since being introduced to painting programs on computers, Lasko now spends about 10 hours a day pixel painting, executing pieces that resemble a mix of retro computer graphics and pointillism. An inspiring piece about how the journey of an artist never quite ends, and how technology has enabled people to keep on going in the face of adversity. This brought some much needed cheer to my day. Hal's family is currently selling prints of his work over on his website, as a means of raising funds to make his next birthday that much more special. 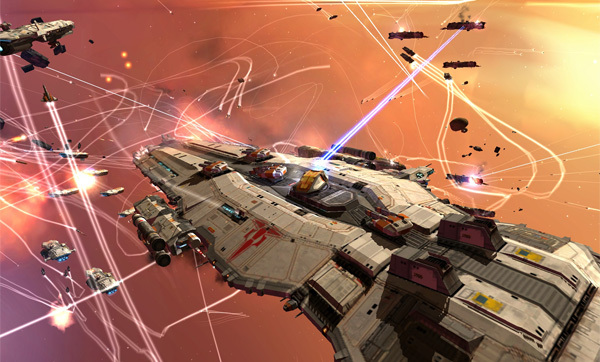 With the recent news of Gearbox choosing to move ahead with HD remasters and potential sequels of the Homeworld franchise (Who's original creators are working on a spiritual successor called Hardware), I'm sure custom Lego builders all around are rejoicing at a chance to see this franchise return after a long period of dormancy. I get the feeling that Homeworld became a huge point of attraction to many Lego builders thanks to the modular, angular designs of the fleet ships that were omnipresent in the title that lent themselves well to being translated into brick form. 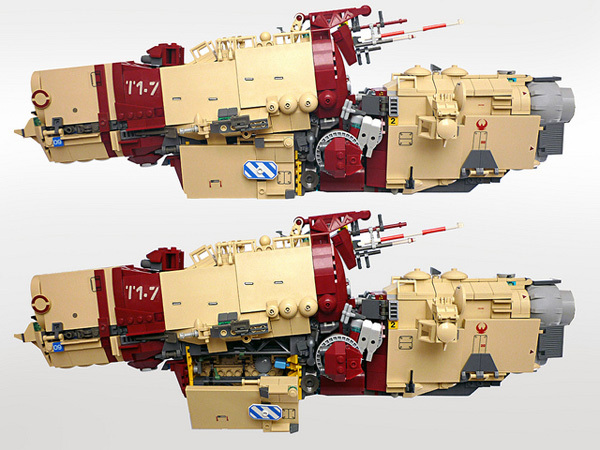 Over the years it seems to have become a prevalent practice for any good Lego builder to take a stab at recreating these ships to prove their mettle, like hobbyist and designer Pierre Fieschi, who even went so far as to expand the universe with his own creations. Check out more of his amazing Lego endeavors after the break, and like me you'll hopefully contemplate adding another pricey hobby to your list of daily activities. We brought you Mypet's Pays to Know music video several months ago, and now they've recently debuted the video for their single, Tiger. Both are from their 'Reflex' album, released just last month. The equally moody video has similar aspects of fantasy, with a captivating sense of mystical exoticism, including some truly amazing portrayals of strange alchemy's at work. The blend between live shots and special effects were seamless, and truly beautiful. Chroma Squad is a Sentai management, tactical turn-based, meta-game clusterf*ck of awesome. Take the role of managing and recording episodes for your Sentai TV show by hiring actors, purchasing equipment, and making use of special effects as you kick the crap out of enemies. While there's a very small subset of Sentai titles that have made it's way to North America, it's awesome to see an indie team take the reins and make something of their own. With hints at giant robots and monsters, I'm not really sure Chroma Squad could get anymore awesome, especially with it's ridiculous level of meta-game business management mixed with a turn-based RPG. The small 7-person team at Behold Studios has something truly special on their hands, and their Kickstarter shows a lot of heart and passion for the project. It isn't every day a game is made that cuddles up next to you and whispers about how awesome your childhood was, especially a game that could potentially fulfill all of your Sentai needs like Chroma Squad promises. Don't let this game pass you by, to donate head over to their Kickstarter page and check it out. Sometimes when you have no direction in your life, putting all your eggs in one basket is the most adventurous thing you can do. 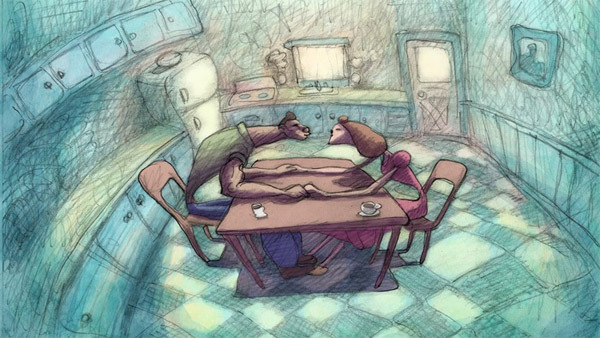 Fortune Elephant Dream is a short animation about a man with seemingly nothing to look forward to, in order to fill a hole in his life he bets it away. Trust me though, it's really not a s horribly depressing as it sounds, in fact it's a pretty damn fun animation. Directors Oliver Lourry, the folks from Noidentities, and their entire animation team have an incredible knack for character animation, giving both a realistic yet slapstick approach to the character's movements. The visual quality is topnotch, approaching some of the top animation studios with it's own identity. Mixed with an entertaining set of 2D art by Frederic Mace and Yue Wu, Fortune Elephant Dream gets an A+ in my book of animations for both sheer quality and entertainment. Reminder - Mercenary Kings Early Access Is Available Now! 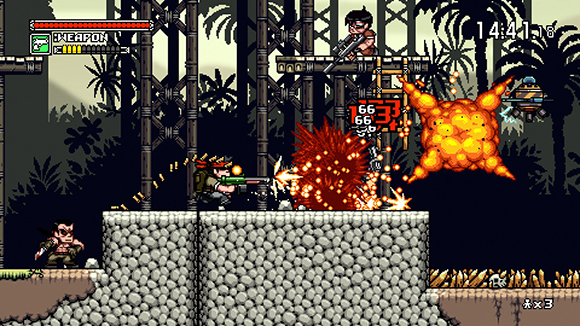 After months of waiting Mercenary Kings, one of our top picks from E3 is finally out, well kind of. Last month Tribute Games announced they would be releasing the game via Steam's early access, giving gamers the chance to get their hands on the game before it's completion. If you're still unsure of what Mercenary Kings is, imagine if the Metal Slug genre was given hundreds of customization options for it's weapons and then set you loose in an arena to hunt down your bounty. After that, imagine some of the best pixel art you'll ever see this generation is thrown on top for good measure, then try to convince yourself you have no interest in the game. For $14.99 you can pick up the game's early access for now, or can you drop $44.99 for a 4-pack and be super awesome to your friends. They'll appreciate it. Giants seem to be all the rage nowadays. With the fantastic Attack on Titan and Guillermo del Toro's masterful Kaiju film Pacific Rim there certainly isn't a shortage. While both works do their part at creating some incredible scale, YongSub Noh has perfected the craft, offering some incredibly perspectives and beautiful creatures. Each of YongSub's pieces creates an incredible dynamic with the creatures of his world and the environments the inhabit. The design of both the giants and the environments is absolutely phenomenal and sits with the best of the giants. After the break are nine more incredible pieces for you to gawk at. A truly fun animated short from the folks at Humble TV, Tumbleweed Tango follows a balloon dog pup venturing through a treacherous desert overflowing with sharp perils. Upon meeting an unlikely stranger in the midst of his journey though, he embarks on a tango of life and death to escape his hostile environment. Aside from the fun concept, the team did an awesome job capturing the way a balloon animal would move and look if it were alive, with plenty of secondary animation and some awesome sound treatment to boot. Awesome from start to finish. Mono, who also goes under the monicker of Moss Elephant Turtle (亀のこけぞう) is a talented 19 year old illustrator from Sapporo, the capital prefecture of Hokkaido with some awesomely colorful illustrations, mixing his interest in Japanese street culture, anime and surrealism into a fine paste of striking, nearly glitched out imagery. The influences here are undeniable, with the famously unconventional art of Hirohiko Akari (Jojo's Bizzare) being a lightning rod of influence for many young artists in Japan these days, with his unconventional color schemes (Inspired by Paul Gauguin), high fashion inspired designs and exaggerated poses. Unlike Akari's high fashion approach though, Mono offers a more street fashion centered approach based off of the many fashion cliques that exist throughout Japan, ranging from Western obsessed Ganguro girls to baseball fan fashion trends. The result is both colorful visually as it is thematically, and my eyes can't seem to get enough. Can't wait to see where Mono will be skill wise in just a few short years, considering his progress already. More of his work after the break. Wonderfully relaxing visuals of nature in motion are on the menu today with Don't Give Up, set to the incredibly blissful synth-pop of Washed Out's Ernest Greene, who's put me to ease with his latest slew of tracks from his upcoming August 13 album, 'Paracosm.' The sheer amount of majestic close-ups of beautiful animals and the uplifting lyrics should provide a much needed upper to anyone in need. Ace Producer Ben Allen (Deerhunter, Animal Collective) has been working on giving Washed Out's tracks that much needed polish and gloss, and it definitely shows between this latest track and It Feels All Right. Adding this to my ever growing playlist of tracks to drive into the sunset to, anime ending style. The Buenos Aires based animation and design collective called Lumbre just released their awesome branding package created for the regional 'Sol Musica' channel for 2013, offering a set package of awesome, colorful visual idents with a cohesive feel created for the first all Spanish music channel. Completely done in traditional animation, the theme is definitely high energy and fluid, similar in feel to the equally amazing Cartoon Network Summer Collab animation mashup. Amazing eye searing idents paired with the nearly ska-like music of the Argentinian/Spanish rock group called Tequila, track is Y Yo Que Se. Created as a collab between Mexican artist Curiot and the Berlin based creative duo known as Low Bros, this chill timelapse covers the creation of a dueling mural, featuring the distinct takes of two groups on the same subject for Berlin's FIT 2013 (The Filling Station For The Creative Spirit). Music in the video is Steel Strings (Kyson Rework) by Geordie Little. The Origins Of Neil Blomkamp's Next Project - "Chappie"
While Elysium draws near, another project has already popped up under Neil Blomkamp's IMDB tentatively called Chappie with a tentative release date and some attached cast set for 2014. It's been interesting to see his path as a director, revisiting proof of concept shorts filmed in the past and turning them into fully fleshed out features, including Alive In Joburg, a 2005 short which would go on to become the critically acclaimed District 9. 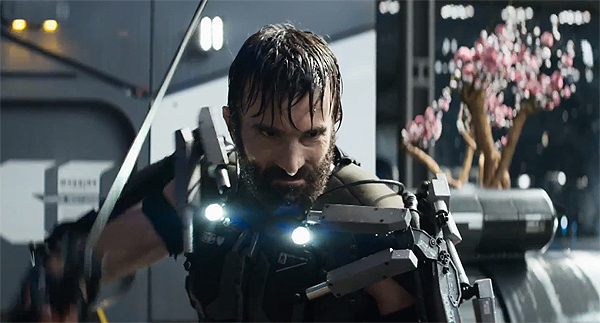 Sharlto Copley as Kruger in Elysium. Chappie is going to be based off Tetra Vaal, a 2004 short created as a test for motion capture and compositing. The short features a robotic cop patrolling the streets of South Africa, tying into an ongoing theme of setting his movies in third world countries to offer a different perspective than most movies out there. South African actor Sharlto Copley (Who played Wikus in District 9 and Kruger in Elysium) has already been cast as the robotic cop, with rumors of Dev Patel (Slumdog Millionaire) also in talks for a leading role. All these little pieces lead me to believe that we'll be looking at the equivalent of an alternate reality take on Robocop next year, which I honestly can't wait for. JonTron may no longer be with Game Grumps, but his presence with the show will always remain in our hearts and most certainly the animations made by the community. The banter between Arin and Jon lends itself incredibly well to over-animated versions of themselves, something that the Game Grumps community has made great use of. Animator Joelcalibur has created this incredibly fluid animation for the famed Black-Bellied Budapest banter. 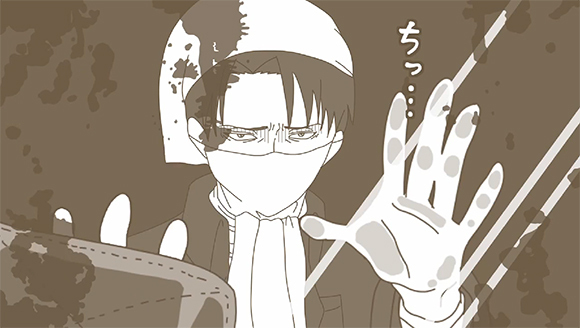 Fandom art is one thing, but seeing animation of this quality is a sight to behold, especially from a one man time. 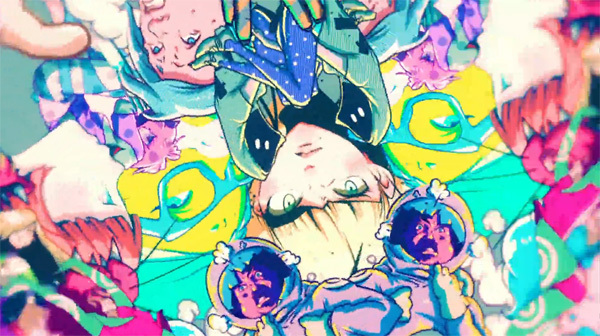 Student animator Eric Ko created this trippy but cool animated short, entitled Our Son, which was selected for Cartoon Brew's Student Animation Festival. Described as a transition for reckless irresponsibility to reality, the story was inspired by the childhood of Ko and his friend. It's very stylized, and transitions from desaturated to very colorful. The whimsical feel fits the erratic, crazy nature of childhood, and then settles in a more neutral feel, i.e. adulthood. We've featured quite a few incredible cosplay videos in the past, but arguably the best part about convention time is Mega64's Cosplay series. Combined, I've probably watched Mega64's COZPLAYERZ series more than anything else the group has done, but that's all for good reason. Not only is their Freezepop tinged song choice catchy as all hell, but who could say no to the incredible cosplays of, 'Bony Stark' and 'Men?' While this cosplay video might be the best thing you'll ever watch, just remember that you don't need to be sad that the video is over, convention time is but a yearly occurrence. No, unfortunately SOS: Ship of Sacrifice isn't a Titanic simulator, but in many ways it beats the tragic story between Rose and Jack (excluding Leonardo DiCaprio of course). Ship of Sacrifice is an online co-op adventure game, where players must work together to escape a disease ridden ship by using communication and wits. 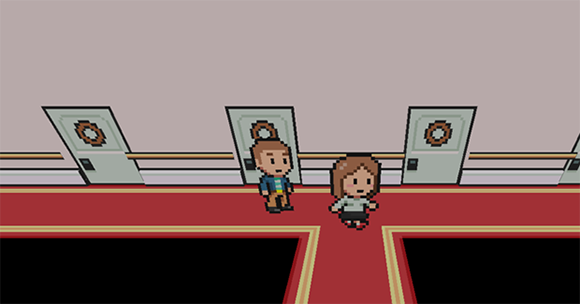 Using a blend of both adventure game and RPG mechanics, it isn't much of a surprise to see the Earthbound/Mother series influenced artwork. The gameplay shown is enough to perk my interest, and with the developer's at Water Bottle studios' emphasis on co-op focused puzzles, this will hopefully introduce a variety of puzzles outside your stereotypical, "press the button at the same time"-mechanic. It's a rare sight to see an online co-op game that is more exploration and story driven amongst the mass of co-op shooters. With only 10 days left the game is sitting at around $3,000 of it's $40,000 goal, a long stretch away but not entirely impossible. Check out SOS: Ship of Sacrifice's Kickstarter page over here, the tier rewards are pretty dang modest. Created at the Emile Cohl Academy in Lyon by Jeff Le Bars, Carn tells the story of a lost boy and his encounter with a desperate, dying wolf who offers him a choice: Either perish in the unforgiving cold of a harsh winter, or sacrifice the wolf for warmth in exchange of taking care of her cubs and raising them as his own, or else. The 3D art style used in Carn is absolutely stunning, emulating a truly unique look which comes off as a cross of Zelda's Windwaker style and classical storybook. Following the darker story of the short, Jeff Le Bars incorporated plenty of highly stylized play between lights and darks to visually match the tone. One of the best self contained stories I've seen this year so far. 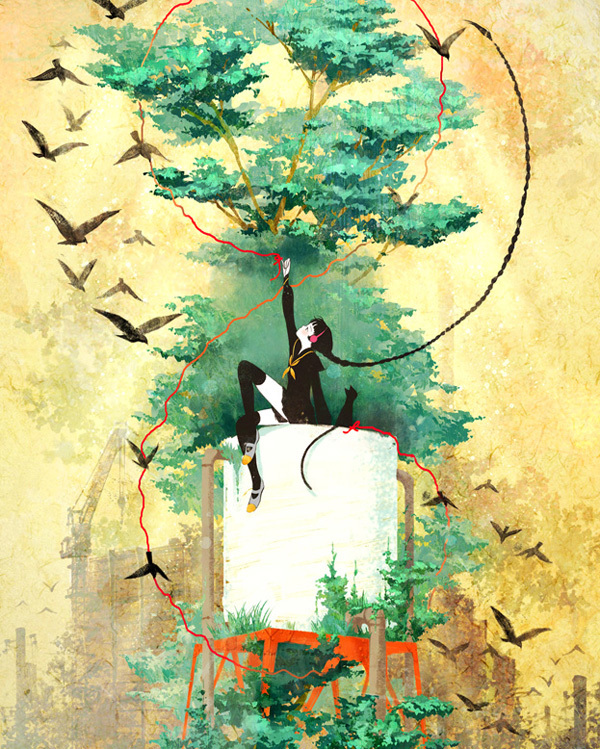 Staggering vertical compositions and heavy turn of the century illustration aesthetics are the staples of Hunsay's awesome art style, a pretty damn talented 25 year old illustrator from China. As well as paying some rather interesting tributes to Kentaro Miura's ongoing fantasy epic (Berserk), he also has an affinity for creating serene scenes featuring relaxed, content subjects. His grasp on incorporating a pleasant mix of painterly and graphic elements in his illustrations definitely draws from the style of artists like Alphonse Mucha, J.C. Leyendecker and Norman Rockwell, who used varying degrees of the formula to create striking, timeless pieces that continue to influence artists today. Check out more of Hunsay's towering illustrations after the break. Created by Andrew Walker during his 17 day trip to Iceland, Pathfinder is a chronicle of striking imagery witnessed in the month of June, which has some of the longest days of the year in the region. Covering around 4,000 miles while exploring the island during that period in an SUV, this journey allowed him to witness amazing landscapes ranging from beautiful to outlandish and nightmarish. Most shocking was his choice of music, opting to go with the brash Immigrant Song from The Girl With The Dragon Tattoo instead of the typically chill, minimal soundtracks that accompany these types of visual travel logs. Created by design collective Nomoon, Vespalogy is an awesomely poppy, graphic retrospective for the ever so trendy Vespa (Italian for Wasp) scooters, manufactured by Piaggio in Pontedera, Italy since 1946. This is their tribute to the iconic scooters, simply created out of their own love for the brand. It's a little reminiscent of the excellent 'Hands' ad chronicling the entire history of Honda, which you should also check out while you're at it. Alexander Taccarino, who goes by the alias of 'That Kid Who Draws' has been rocking it recently, embarking on an independent, Mondo print style journey with custom posters over the last few months for titles including The Last Of Us, Evangelion, Jet Grind Radio and Akira. 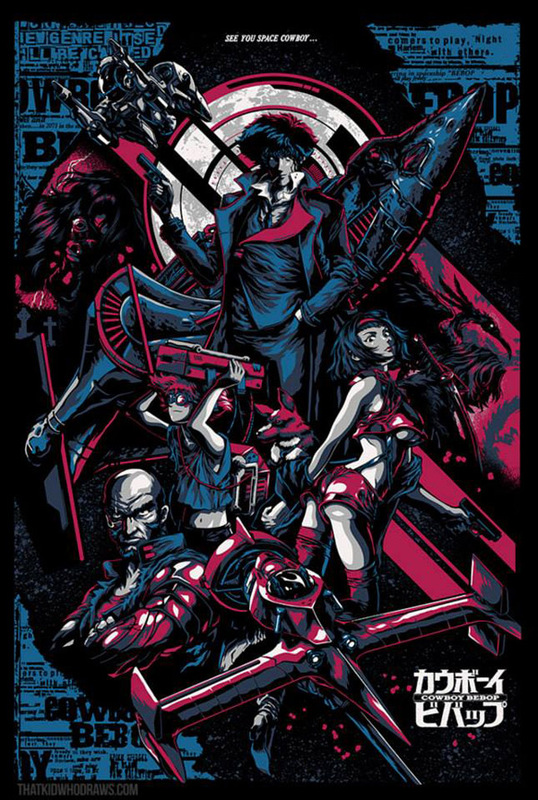 His latest personal limited edition run comes in the form of an awesome piece for Cowboy Bebop fans titled 'See You Space Cowboy,' which is coming out sometime today. The 5 color 24"x36" screenprint will go on sale at a random time today, with a regular edition of 100 prints priced at $55 and a secrent variant run of 30 that will be priced at around $75. Head over to the That Kid Who Draws website to await the drop if you're a fan of the classic anime, and check out some close up shots of the print after the break. Following a long night of partying on a yacht, a diverse group of party-goers find themselves drawn to a mysterious island in this dialogueless short created at the Parisian Supinfocom animation academy. When a sudden mysterious event deprives them of their only means out of there, their only choice is to head further inland to figure out why nobody ever seems to leave this strange, surreal island intact. The short is notable for it's seamless mix of 2D and 3D, using a painterly aesthetic for it's 3D as well as digitally painted backgrounds. The short also succeeds at being strangely unsettling despite it being an extremely lush, sunny day thanks to the lack of dialogue and effective sound treatment, including one instance of the Wilhelm scream. Created by Rémy Busson, Francis Canitrot, Aurélien Duhayon, Sébastien Iglesias, Maxence Martin and Paùl Monge. Following the recent trend of artfully shot cosplay videos that have become a full time job for some, Sneaky Zebra's London Comic Con is no exception, featuring the cream of the crop in cosplay present at the con. Using some equipment reminiscent to a gyroscopic gimbal stabilizer to provide some fluid moving shots as well as a little post processing work, this video is pure fun from start to finish. LFCC, one of the biggest conventions in London featuring a range of uber cool guests from shows like Game of Thrones, The Walking Dead, StarGate & Doctor Who took place in early July & we couldn't resist taking along our FlyCam to capture some of the awesome cosplayers. We might of also sneaked in a few special guests to this video. Mickey Mouse In "Stayin' Cool"
On a sweltering day of heat, Mickey and friends desperately attempt to figure out how to cool off, much to the dismay of a wealthy mansion owner, butcher, ice cream truck owner and so on. The sixth installment in the series, this particular short appears to break the usual formula, taking place in a non distinct US city unlike it's globetrotting predecessors. Check out the rest of them here, and we apologize to our overseas readers as we are aware that these shorts might be region locked. 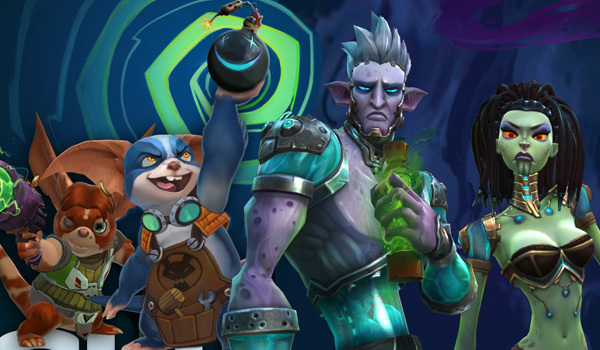 Originally teased in the announcement videos for the Meet the Dominion and Exiles, the folks at Carbone have finally unveiled the final two races in their upcoming Wildstar MMO. The Chua, aligned with the Dominion are a race of furry, tinkering, psychopathic mad scientists with a knack for destruction. The Mordesh, aligned with the rebel Exile faction are an afflicted, mutated humanoid race, infected with a strange disease that they're desperately trying to cure. Following the reveal I think we'll definitely be getting our hands on those crazy Chua when we get a chance to take the beta for a spin. Really been loving these hand crafted promos, especially the amount of personality they manage to imbue in each of them. Head on over to the Dirty Little Secrets page to learn more about the two races, as well as for signing up for the beta! One day remains to check out Adult Swim's Fun House at San Diego Comic Con, but that doesn't mean we can't show off their awesome 30 second spot by Chris Golden. The Adult Swim Fun House is a 10+ room experience where guests are challenged to make their way to the end by completing a set of different feats, all for the hope of receiving an exclusive screen printed t-shirt. Whether that's your thing or not, you gotta hand it to Chris Golden and Adult Swim for creating this fantastic TV spot, they continue to push creative boundaries with a large offering of original works. If you're at San Diego Comic Con and get a chance to check out the Fun House, let us know! We'd love to hear what it was like! I've been thoroughly impressed with the amount of awesome indie flash games coming out lately, not only are they a blast but I've found that the controls are more tight than a lot of console games lately. Dyna Boy isn't any less impressive, in fact I found it to hold the same quality as a large majority of paid downloads, which says a lot about the commitment Neutronized studios has when it comes to creating games. In an age where folks are hoping on the development train to pull in a few quick bucks through Kickstarter, it's a pleasant surprise to see true gamers share their passion without any expectations of making money. Head over to Neutronized's website and give the game a go yourself, I couldn't put it down. 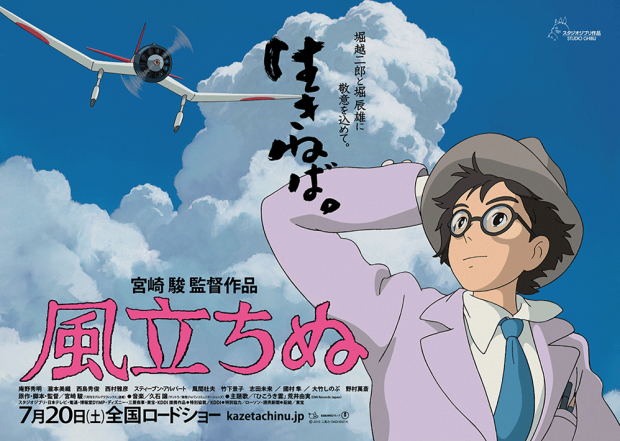 Partially inspired by Hayao Miyazaki's own manga, Kaze Tachinu, the famed animator is back in the director's seat for the first time since 2008's fantastic Ponyo (a personal favorite of mine). Set during World War II, it tells the story of Jiro Horikoshi, the real-life engineer and visionary who designed Japanese fighter planes during that time period. The trailer appears to touch on one man's attempt to balance his personal dreams of flying and that of an empire with completely different intentions. Previously we were shown a teaser trailer, and just recently the full 4-minute trailer has been released. 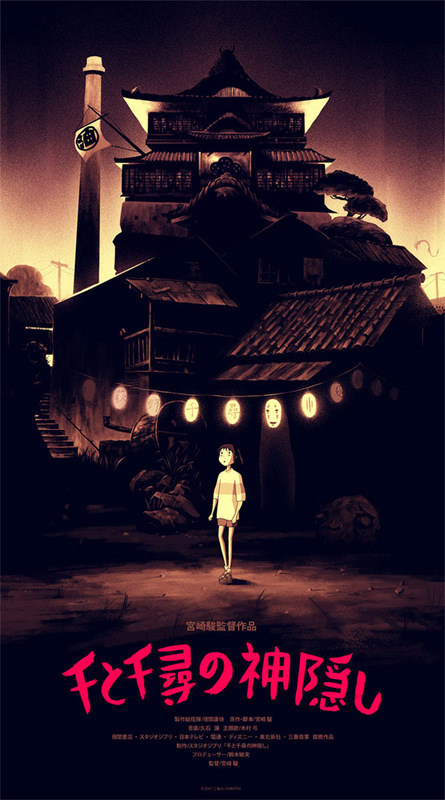 This new film appears to be following the recent Ghibli trend of following more closely to reality, as opposed to fantasy, with 2012's Up on Poppy Hill coming to mind. While we absolutely loved the fantastical films previously released, it's refreshing to see what appears to be a change of pace. With today (July 20th) being the Japanese premiere date, we can't wait to find out when our local US date will be. The plot concept is super simple: This slice-of-life shows us the day of an 80's era regular, middle class family. Nothing too crazy: Dad wakes the kids up, Mom makes breakfast, then school, dinner and so on and so forth. I think that's what drew me to this 3D animated short: the simplicity of everyday life and routine (not that I'd want that every day, but you know what I mean). The art direction is pretty whimsical, employing a style for the characters reminiscent of a bizarre cross between Mr. Potato Head and Fisher Price's Little People. Back In The Day was created by animator Rok Predin, in collaboration with the UK-based Trunk Animation. As part of the upcoming barrage of new reveals that this year's San Diego Comic Con is unleashing on us, the Legend Of Korra panel revealed some juicy new details about the second season, including this moody new trailer, offering us a taste of some of the challenges Korra and friends will face starting this September. The most noteworthy plot point for the second season will come in the form of the recently announced origin story of the very first Avatar, Wan, who will be voiced by the Steven Yeun of The Walking Dead fame. Is it just me or does this franchise keep looking better with each passing season? The first season of Korra had some amazing animation and all, but it already looks like the bar is being set even higher for this upcoming season. Kickstarted back in late 2012, Cheatin' was successfully backed earlier this year, surpassing it's modest $75,000 goal. Fast forward to July and we get our first trailer, narrating a seemingly perfect relationship gone horribly wrong, and one woman's quest to tempt destiny. Employing an impressionistic, sketchy style with water color washes, Bill Plympton drew every single frame of the feature, 40,000 in total along with a crew of 10 artists employed to help with clean up and compositing. Following the Kickstarter, Plympton and his team kept a very robust production blog on Vimeo, featuring a few hours of behind the scenes footage. Check it out here. In a fateful bumper car collision, Jake and Ella meet and become the most loving couple in the long history of Romance. But when a scheming 'other' woman drives a wedge of jealousy into their perfect courtship, insecurity and hatred spell out an untimely fate. With only the help of a disgraced magician and his forbidden 'soul machine,' Ella takes the form of Jake's numerous lovers, desperately fighting through malfunction and deceit as they try to reclaim their destiny. Animated by Yoko Kuno for Japanese artist Cuushe's debut album, dubbed as 'Red Rocket Telepathy,' Airy Me is an ethereral, dreamy electro-pop track driven by Cuushe's delicate vocals. The visuals pay a definite stylistic homage to the works of Osamu Tezuka and Katsuhiro Otomo, with the doe eyed nurse protagonist of this short dealing with an unexpected horror either born from her own mind or some supernatural process. With it's never ending animated movement, Airy Me turns into a mesmerizing trip open for your own personal interpretation. If you're interested in learning more about this debut artist, check out the English friendly label publishing the work of Cuushe, 'Flau' right here. Love it or hate it, you can't deny that Pacific Rim delivered a visual spectacle unlike anything we've seen before, offering us a take on a genre untapped here in the west (Excluding b-movies). The fine folks at Legacy Effects, a special effects studio specializing in animatronics, specialty suits, prosthetic make up and creature design put together a series of behind the scenes mini-featurettes focusing on the work they put into Guillermo Del Toro's Pacific Rim. Focusing on the pilot suits, different iterations of helmets and a few key components of the pretty awe inspiring animatronic command set (Which we featured right before the release of the film), the attention to detail and passion is definitely palpable. This new wave of prop building is a pretty amazing look into some of the new techniques being used, especially high end 3D printing to create entire suits from templates modeled in software packages like Maya. If the company name doesn't ring a bell, Legacy Effects is comprised of multi-decade Stan Winston Studio veterans that went on to found their own house following the passing of the special effects visionary back in 2008. They've contributed to high profile projects including The Avengers, Iron Man 3, The Life Of Pi as well as the upcoming Robocop and Xmen: Days Of Future Past. Check out the mini-featurettes for the helmets and the custom built command module after the break. Samurai Jack has always been Cartoon Network's magnum opus for me. Genndy Tartakovsky's ability to blend a serious journey of a lone wanderer with a strong and well thought out post-apocalyptic future, as well as some of the best comedic timing to ever grace an animated world has remained untouched since the series cancellation in 2004. It was a cartoon tragedy when the series finally came to an end, especially without any solid resolution to appease fans. Luckily Tartakovsky and IDW aren't leaving fans out to dry any longer. The comic book publisher has announced a return the series after a nine year hiatus. What does this mean? Samurai Jack might finally get back, back to the past. This news hits me pretty close to home, as I remember being devastated growing up to know that Samurai Jack's story might never be finished. 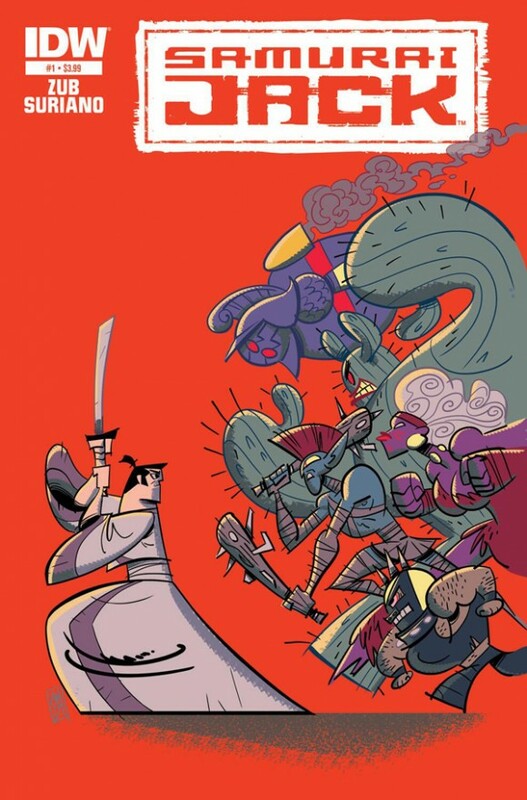 The first issue is set to be released in October with a variant cover by Tartakovsky himself and Chew's Rob Guillory. Prepare yourself. Two more alternate covers for the comic after the break! 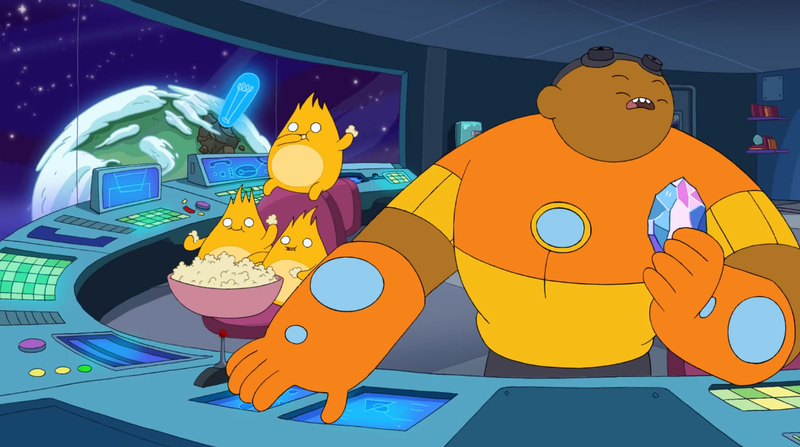 Oh hey, look who's back it's Bravest Warriors. After a brief hiatus the series is back and better than ever, although this time the team is experiencing a bit of a speech issue. Is it just me or does the animation look better than ever? It amazes me how quickly these episodes are pushed out, especially with the amount of quality each one holds. I recommend for the newest episode to turn on YouTube's fantastic auto-captioning service, it adds a whole new layer to this episode. An awful, poorly translated layer. While nothing was referenced to the last episode in terms of a larger story arc, the overall action of the series seems to have kicked it up a notch. Here's hoping the continue hinting at something bigger in future episodes.